Goodbye Snickers. Goodbye Mr. Goodbar. There’s a healthier way to get your chocolate-crunchy-nutty fix and you can make it yourself in fifteen minutes. With only TWO ingredients! It’s really easy, and they’re really good. 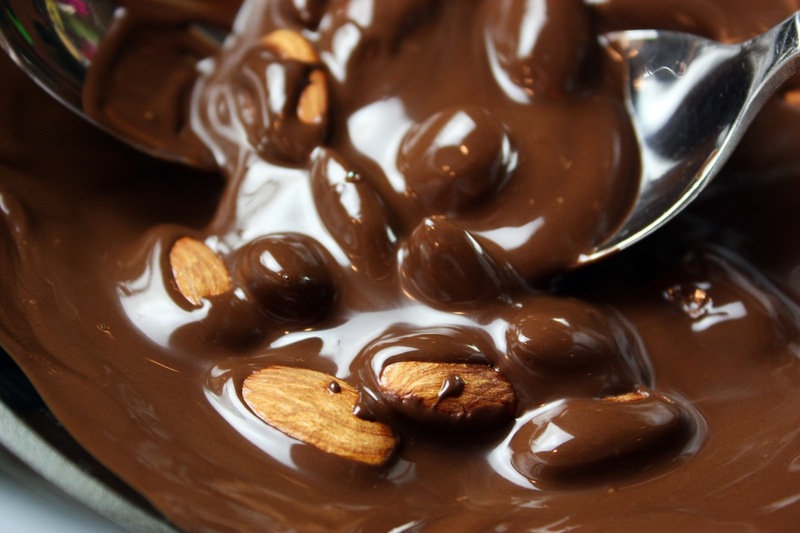 I’m basically melting a good quality dark chocolate bar and dropping in some toasted almonds. My favorite chocolate bars for this recipe are Ghirardelli Semi-Sweet, which comes in a 4-ounce bar and Scharffen Berger 62%, which is 3 ounces. World Market also makes a good 72% 3-ounce bar. I do this with a double-boiler method but who has a double boiler these days? Not me. So I put a glass pyrex bowl on top of a small saucepan with about an inch of water and that’s my double boiler. It’s important that the bottom of the bowl does not touch the water and that you do not use a rapid boil. Just bring the water to a boil and then to a low simmer to melt the chocolate. I break the chocolate bar (3 ounces) into chunks, into the bowl, and let it melt, stirring occasionally. While it’s melting, I set out fifteen little one-inch candy paper cups. They’re like cupcake liners but smaller. When the chocolate is melted, turn off the burner and start dropping in the nuts. Stir them around until they’re coated and lift them out in clusters, using 2 teaspoons, and drop them into the cups. At the end, whatever chocolate is left can be taken up with a little spatula and dropped onto some of the clusters. You may have to re-warm the chocolate at the end. I have made these clusters without the paper cups and just dropped them onto wax paper to cool and it works, but they will spread. The cups make a nicer presentation too. I strongly urge you to toast the nuts and not to use plain raw almonds. Toasting nuts greatly enhances their flavor and aroma and you can do that in advance. I just toast all the nuts I use at one time and keep them refrigerated for my baking. 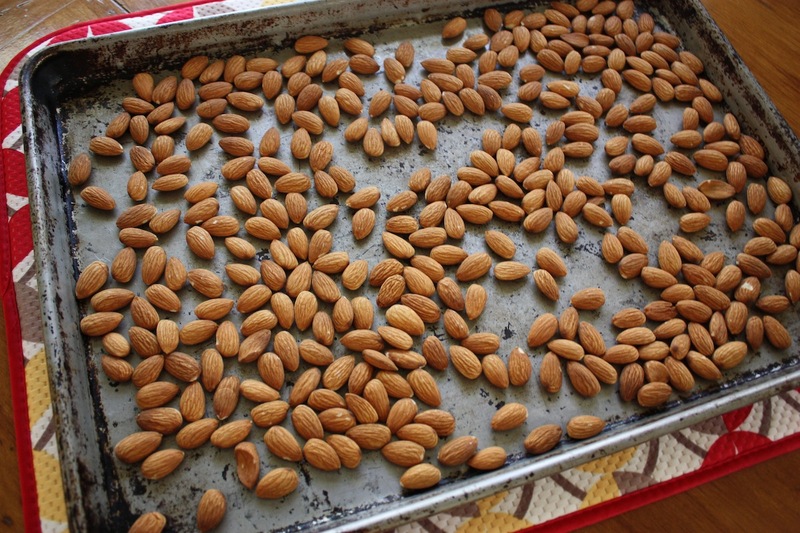 I do a sheet of walnuts, then pecans, and then almonds and they are always available without having to wait for them to cool. I just did some over the weekend. 3 Comments on "Dark Chocolate Almond Clusters"
In the suburbs they will make this with Semi-sweet chocolate morsels and dried grated coconut. In the city they will nuke a couple Hershey bars and mix in a bag of peanuts. I used Trader Joe’s bittersweet and roasted fresh Macadamia nuts. Kids in the suburbs will make this with a bag of Nestle’s semi-sweet morsels and grated coconut. Inner-city kids will nuke a couple Hershey bars and mix in a bag of peanuts. I made it with Trader Joe chocolate and Macadamia nuts. Thank you sounds great, cheers from Australia.